“I’m confident that they have already begun to use this experience as a life lesson,” he added. The No. 23 Bruins edged Central Arkansas 106-101 in overtime in their home opener on Wednesday night. “I’m sorry for stealing from the stores in China,” said Ball, the younger brother of Los Angeles Lakers rookie Lonzo Ball, who played last season at UCLA. “I hope you can forgive my stupid, childish actions,” he added. Riley was the first to speak and he thanked the Pac-12 Conference, several UCLA administrators and his teammates. Athletic director Dan Guerrero also spoke at the news conference, but no one took questions from a large group of media. Alford said at some point, the trio may be permitted to join team workouts, meetings and practices, but that timeline has yet to be decided. “We will come to a resolution in short order,” Guerrero said. “I’d like to thank President Trump and the United States government for the help that they provided us as well,” Ball said. The players were detained in Hangzhou for questioning following allegations of shoplifting last week before the Bruins beat Georgia Tech in their season-opening game in Shanghai. The rest of the UCLA team returned home Saturday. Guerrero said the incident occurred when the team was given 90 minutes of free time on Nov. 6 in Hangzhou. “Those three visited several stores, took items from three stores and returned to the hotel,” he said, without revealing the items taken or their value. The next day, Guerrero said, police arrived at the hotel shared by UCLA and Georgia Tech and interviewed both teams in an attempt to identify the culprits. Police searched the players’ personal belongings and the team bus before identifying Ball, Hill and Riley, he said. No one from Georgia Tech was implicated. Guerrero said the UCLA trio was taken to a police station for questioning, and Alford arrived later, along with basketball administrator Chris Carlson. Guerrero found out while flying to Shanghai. After being arrested, the players remained in custody for questioning and were released on $2,220 bail on Nov. 8. Guerrero said they had to give up their passports and agree to travel restrictions. Upon their release, they remained in a hotel at UCLA’s insistence, not the local police’s, with Carlson and another administrator supervising them, Guerrero said. He said the bail money was refunded by police. Once the charges were withdrawn, the trio acknowledged breaking the law, he said. Guerrero said UCLA provided the resources to help the players and the university is working to see who is responsible for costs and any NCAA implications. Police told the players they could leave the country on Tuesday and they boarded a plane later that day. Guerrero said Alford reminded his team of the expectations for good behavior before they left on the trip and while they were in China. UCLA traveled to China as part of the Pac-12′s global initiative that seeks to popularize the league’s athletic programs and universities overseas. The China Game is in its third year, and while the scandal was developing the league announced that California and Yale will play in next year’s edition. 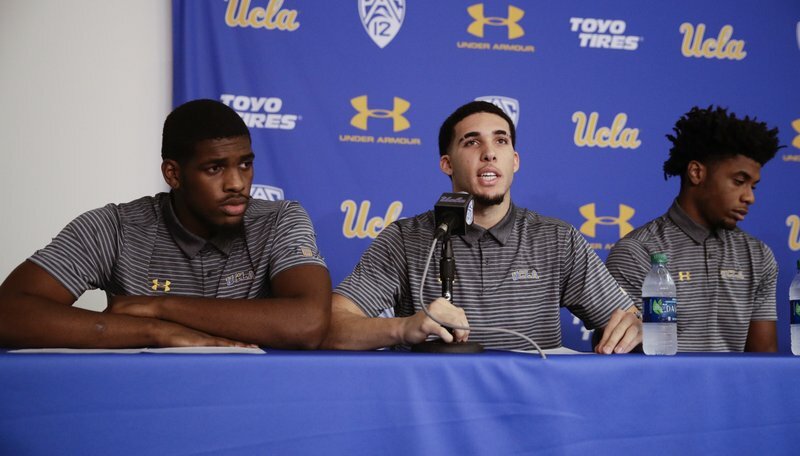 0 Response to "3 UCLA basketball players suspended after theft in China"